Collaboration is one of Illinois State University’s core values, and “Collaborate with our Community” is one of the five objectives in Mennonite College of Nursing’s 2018-2023 strategic map. It’s a word tossed around lightly at times—jargon—a trendy word that makes people feel good. But what does it mean, really? And what does successful collaboration look like? The best examples of collaboration involve people coming together and simply doing what is necessary to get things done. There is no angle—just people working hard for a common purpose. Most of the time, these collaborations fly under the radar and are difficult to spot from afar. The partnership between Illinois State’s Student Health Services (SHS) and Mennonite College of Nursing (MCN) embodies the University’s spirit of collaboration to its very core. It is a shining example of two entities coming together and working hard for the betterment of others—in this case, Illinois State students and the Bloomington-Normal community. Nursing student administers a flu shot. 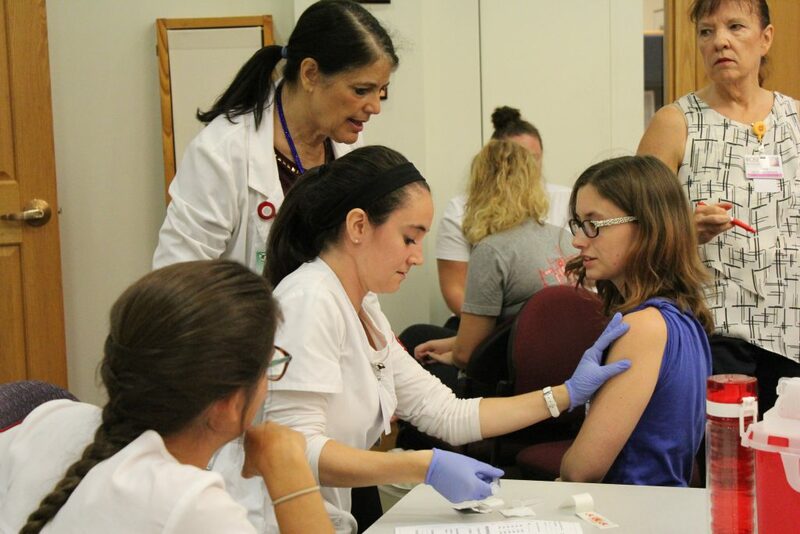 This partnership is not new; nursing students have had the opportunity to give flu shots in partnership with Student Health Services in a variety of ways for a while now. But in recent years, MCN and SHS have started offering mass immunization clinics. Being able to offer the clinics requires a lot of collaboration up front. MCN faculty and Student Health Services staff sit down to talk about the what, where, when, and why. The day of the clinics, the two teams work together on how to set up the room. Flow is an important part of a successful event. 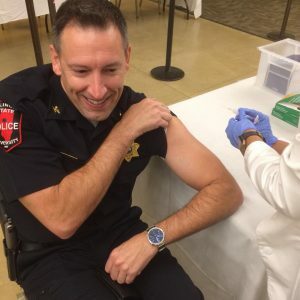 University Police Chief gets his flu shot at the Faculty/Staff Flu Clinic. Student Health Services supplies immunization equipment and support personnel to check forms and get people registered. MCN students handle the rest, with faculty members supervising each time a student administers a shot. Students learn how to deal with situations where a number of people all need services that are quick, efficient and effectively delivered. They learn how to be aware of the needs of the many while making sure they provide accurate, safe care to the one in front of them. SHS staff provide great role models of how to adapt to each client and situation. The experience also counts as clinical hours through America’s Promise Schools Project—MCN’s award-winning pediatric and public health clinical experience. In a given year, SHS-MCN mass immunization clinics service around 600 students, faculty, and staff. They provide students with valuable experience while also making Illinois State’s campus community safer and healthier. And that, folks, is the spirit of true collaboration: good people coming together, working hard, and making their world a bit better. Related Link: Request Information Request information about our nursing programs.